Health insurance is so central to the health and well-being of people that it may be hard for many Americans to believe it could ever have been a less important factor in helping to promote good health than it is today. In fact, health insurance as it is recognized today is a relatively recent development. Since the early development of health insurance coverage, many changes have occurred in the manner in which health care services are delivered and paid for. Among those changes is the emergence of various tax-favored health plans. 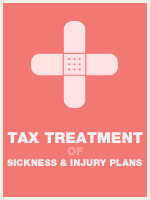 This course will examine many of those tax-favored health plans. Explain the tax treatment of long term care insurance.